AUSTIN – The Hispanic Republican Conference (HRC) of the Texas Legislature has named John V. Garza “Freshman Legislator of the Year.” The Hispanic Republican Conference consists of 32 Representatives (17 of whom are freshmen) who are either of Hispanic descent or represent districts with over 30% Hispanic population. The Hispanic Republican Conference of the Texas Legislature was organized in 2011 by six Hispanic Representatives (Garza, L. Gonzales, Torres, Aliseda, Margo and Peña). The 82nd Legislature was the first with a sizable number of Hispanic Republican members. The election and announcement were made at the Hispanic Republican Conference Sine Die (End of Session) Dinner on Thursday May 27th, 2011. Guest speakers included Speaker Joe Straus and Land Commissioner Jerry Patterson. "Representative Garza is an outstanding Representative and an even greater advocate for the issues important to his community. It is fitting for him to win this award, and I congratulate him for being the first freshman of the year recognized by our organization," said State Rep. Aaron Peña, Hispanic Republican Conference Chairman. 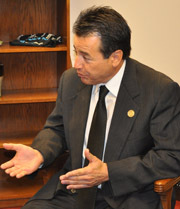 John V. Garza represents Texas House District 117, which is located in far west and southwest Bexar County. His parents USAF S/SGT Arthur and Maria D. Garza were originally from the Westside of San Antonio. As a military family, the Garza's traveled extensively and globally before finally settling back to their Westside San Antonio home in 1967. Rep. Garza graduated from Edgewood ISD's John F. Kennedy High School in 1973. He then attended The University of Denver where he received his Bachelor's degree in Mass Communication in 1977. John married a South San West Campus graduate, Debra A. Garza, in 1980 and has raised five children. He is also the proud grandfather of two grandchildren. The Garza’s currently live and work in District 117 and have always been active in serving and ministering to families in their community.